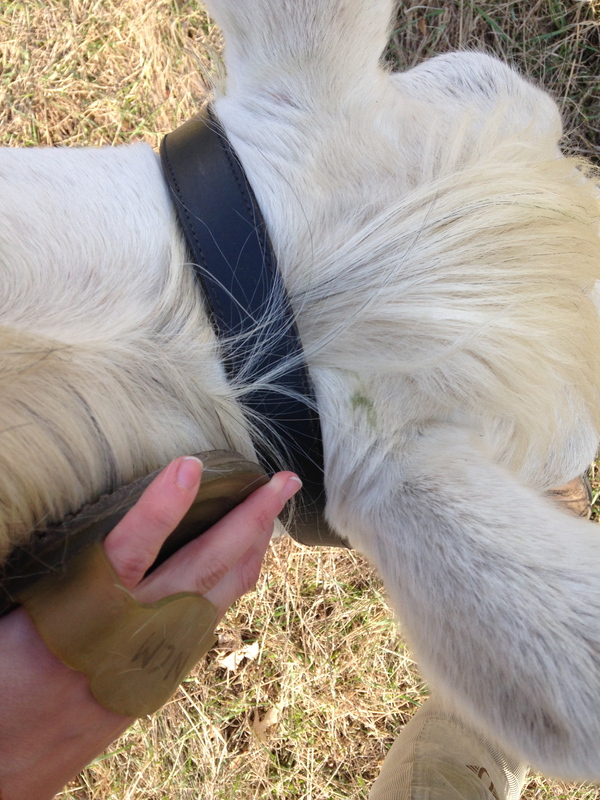 Wednesday 4/16: How you know your horse had a good roll: when she has grass stains on her poll. Then had a ride on Prior– just walk trot bending stuff. She’s starting to get fussy again when she gets tired…probably the biggest problem I have with her (or any horse really) is not quitting when I’m ahead (or at least not behind). Friday 4/18: So many ponies to ride! Pearl’s birthday is the 19th and mine is the 17th so we have to do birthday pictures every year. We walked around the trees within sight of Tucker, pretending to be a mystical unicorn and such. Took some conformation/condition-esque shots as well… definitely looking like a horse that hasn’t worked in ages (just add water and watch the neck melt away! ), but still in better shape than a lot of the time I’ve known/had her. Then headed to the other barn for the next shift. First Carson rode her buddy Derby and I rode Prior. It was…OK. Having a hard time staying motivated with her now that she’s definitely leaving. Not in a picking-up-my-toys-and-leaving sense, but more that we can cruise around and have a pleasant if not necessarily productive ride, or we can try to get at some training issues but there will probably definitely be some resistance involved, and if I can’t follow through on that training, better to just make sure basic buttons (brakes, steering) are tuned than have her thinking every ride is going to turn into a god-this-lady-is-mean session and have that tenseness carry over to rides with her owner. As usual, we got into a no I can’t-won’t/yes you can situation regarding right bend and after getting to an acceptable point I opted to leave the crowded arena and go to the paddocks to cool off, physically and mentally. We did a little more trotwork in there after we’d both relaxed some, and did have an easier time where there was more room to circle or push her over or whatever as needed. Then Carson patiently videotaped me while I rode Eliot. He was fairly tired from his lesson the day before and didn’t think he should be made to do more than one walk-to-trot transition per direction, so we had a little chat about that. He’s still tripping over his feet some but less dramatically. Good thing I’ve posted multiple previous riding videos so the interwebs knows I am in fact capable of posting the trot…his trot is just THAT big, and neither of us have the muscle (yet!) to adjust to something more…postable. Saturday 4/19: Mix it up by reversing usual barn order! When I showed up to ride Derbs, a couple of the other girls at the barn said they were going to go out on trail and did I want to come along. Heck yeah! It’s about time and the weather was perfect. Did the world’s speediest tackup and we headed out. Except, it soon became clear we were not going to get very far. Between the three of us, we had one very green horse, on very-not-happy-about-trails horse, and one experienced-but-not-very-brave horse, and none of us knew exactly how to get to the forest preserve, only that it definitely involved walking along a road. After a lot of walk, grazing break, walk a bit more, we made it to a cornfield and decided to turn back before it turned into one of those negative experience type deals. Like I said…did not get very far. I was super proud of Derby, though. He didn’t spook even at a herd of deer (he may not have actually noticed them, though…oh Derbs), he was happy to take the lead even with some mild shenanigans going on behind him, and he happily popped a little puddle-ditch. 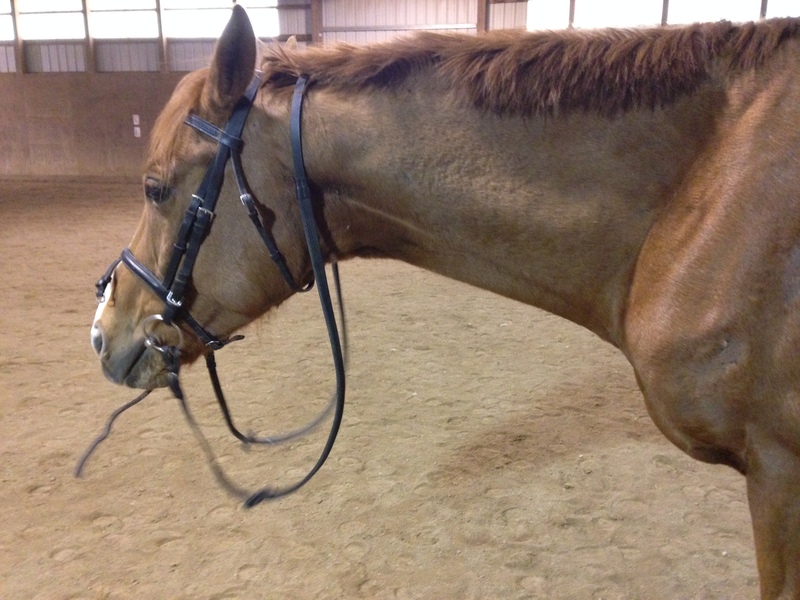 After safely arriving back at home base, we did a little stretchy trot in the arena since he was all nicely warmed up. So, failed trail attempt #89083889902902092. I’m bummed, but it seems to be one of those things just not cut out to happen. Probably for the best really, as I’m sure I’d just be a mope-puss the whole time thinking about how I’d rather be riding Pearl along with J, waiting to hit that perfect stretch of grassy track that was made to be cantered along. It is what it is. I am lucky enough to still have a birthday girl to fuss over. First things first–she ate her birthday mush while I tacked up. Then we did approximately eleven billionty walk-halt-no please don’t try and piaffe-halt-stand still I mean it-walk-halt transitions until mare remembered that walking calmly on a loose-ish rein is in fact a thing she can do. Her birthday present was not getting a bath even though she smells. 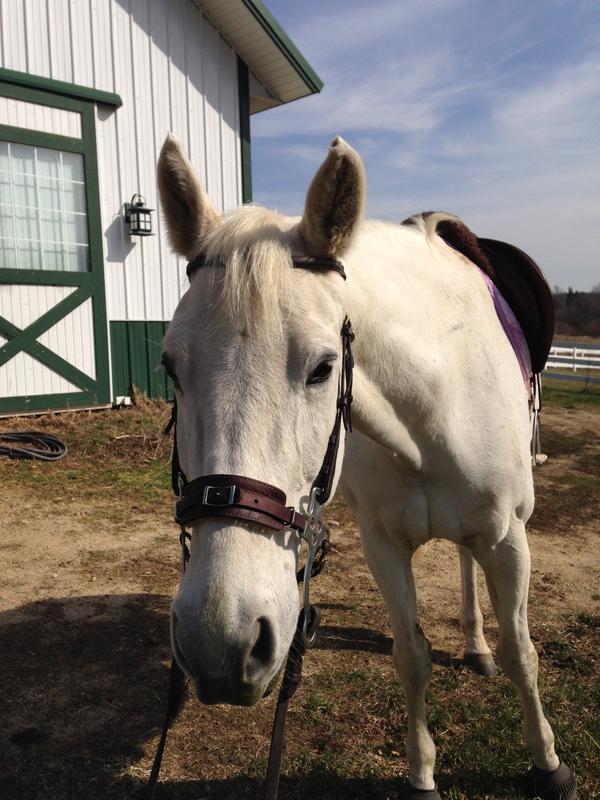 This entry was posted in Weekly summaries and tagged birthday, chestnuts are the best nuts, Derby, dressage, Eliot, green horse, horses, OTTB, Pearl, Prior, Thoroughbred, track my hack, trail ride, Trakehner, video, you only did this to yourself. Bookmark the permalink. I truly think spring fever has a lot to do with a horse’s trail behavior, or outdoor behavior of any sort at least until maybe mid-June. My 23-year-old gelding refused to let me get on him outdoors last week, even after I chased his little pants off till he looked like he just came out of the shower. Had to take him indoors and he still wouldn’t go near the mounting block until we had walked by it several times pretending it wasn’t there. The ride that finally followed was perfect–but indoors! I swear as they get older the spring fever crazies get worse!